It’s me the only one who notice the huge different between the picture taken in Málaga and Madrid? These are from last week when I went to Madrid for the Women’Secret event. The next day, I had some meetings and this was my outfit of the day, no tights but a lot of layers… And of course not, I wasn’t cold at all :) What I love the most about this outfit is the balance between a casual look and the perfect chic outfit, perfect for a meeting, shopping day or to going to lunch. If we separate the pieces, we have a skirt, shirt and over the knee boots which is a very chic base, but it totally changes when we add this maxi-cardigan, with which I’m in love, the faux fur vest and the hat! I love this kind of cardigans. First, because they suuper cozy and warm, and secondly because they help us a lot when it comes to create our outfit in less than 5 minutes :) And yes, lately my go-to uniform is a faux fur vest, hat and boots! ¿Cómo cambian las fotos de Málaga a Madrid, verdad? Estas son de la semana pasada, cuando subí a Madrid para asistir al evento de Women’Secret. Al día siguiente tenía algunas reuniones y este fue mi look, sin medias sí, pero con muchas capas y no… No tuve frío :) Lo que más me gusta de este look es el mix casual-chic. Si separamos blusa, falda y botas, nos queda un look “arreglado”, perfecto para una cena o algún evento, sin embargo, cambia totalmente al añadir este maxi-cardigan, el chaleco de pelo y el sombrero! 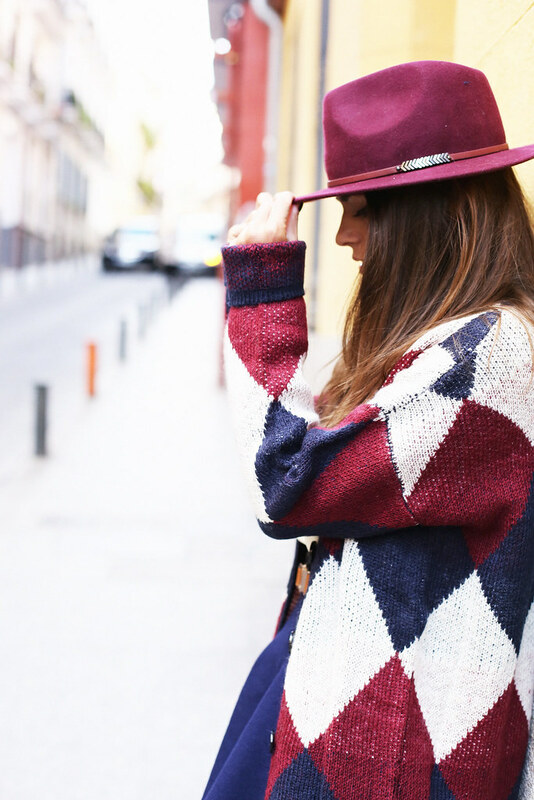 Adoro este tipo de cardigans, son perfectos para crear looks en dos minutos y sobre todo, son muuy abrigados :) Como podéis ver, mi uniforme últimamente ha sido añadir chaleco de pelo, botas altas y sombrero a casi todo! este look es genial Jessie!!! me encantan las botas y el chaleco! You look amazing, love your boots ! Such an inspiring outfit!! Your vest and cardigan are superb pieces! Está claro que la prenda de la temporada son ése estilo de Botas!! El chaleco ideal y el cardigan también, me ha encantado! Te dejo mi nuevo post. .Como Organizar Los papeles del Bebé. Fundas Portadocumentos! Great look, love the colors of the whole outfit!! wow! estás preciosa! me has parecido una tirolesa al principio pero muy guapa!! has cambiado el maquillaje? me encantaría ver un video de como lo haces!! el anterior ya tiene tiempo! es verdad! Os debo un nuevo tutorial con todos mis básicos y mi nueva rutina :) besitos! Beautiful outfit and really nice mix of colours! Que look mas chuli, bonita combinación! El maxi-cardigan super bonito!. Guapísima como siempre!!! me encantan todos tus looks!!! Adoro los chalecos de pelo, crean looks maravillosos. Se puede tener más estilo? No me termino de animar con las botas altas, no porque no me gusten… son preciosas!! Sino porque no sé el uso que les daría, además me gustan las de ante y por aquí con todo lo que llueve no sé si les sacaría partido. Así que hasta que me decida sigo encantada viendo tus combinaciones! Fell in love with that burgundy hat of yours. Burgundy, in general, is a colour I’d like to dress head-to-toe in during autumn season. Anyway, you look gorgeous as always! Wow I need this colourful knit cardigan in my life, it can be worn with a lot of colours! Love the boots too! Wow beautiful outfit, I love it! This look is so chic! Absolutely in love with it, especially love the hat! Un look precioso! las botas me han enamorado!! Great colors, I love burgundy in winter! Me encanta como queda la rebeca con el chaleco de pelos….guapísima como siempre. Me encanta como combinan esos colores!! Un look ideal! Fabulous look Jessie! Love the layering and colours. What size is your maxi-cardigan? que look mas bonito amor. me encanta el como! Un look de 10!!!! Un besazo!! Amazing look! The knitted cardigan and the faux fur vest is an unexpected but amazing combination! Love the colors of the set! ohh que linda!! Haberme saludado, me encanta conoceros a todas y charlar un poquito, así hacemos que esto sea aun más personal :) besitos! Love this outfit!!! the colors are perfect for fall. love the skirt and the boots! ME encnata la combinacion de azul marino y burdeos!!! el sueter y el chaleco me parece que estan hechos el uno para el otro, como siempre super guapa jessy! You look incredible- I love your entire outfit!! Love your vest, great layering. I have been obsessing over hats this winter as well. I love this combination.